The annual graduation ceremony for the College of Sciences took place on Saturday, May 14, 2016. Students in their black cap and gowns streamed into their seats to the sound of Pomp and Circumstance while friends and family waved hysterically, their cameras snapping all the while. The event was marked by welcome speeches from campus dignitaries, and by students who were honored for their academic achievements, including our very own, Charles Moreno, who was recognized as the Outstanding Graduate Senior in the Psychology Department Graduating Class as well as the College of Sciences Outstanding Graduating Senior. To mark the occasion, the Dean of the College, Stanley Maloy, congratulated the students on their achievements then was joined on stage by the Associate and Assistant deans of the College to begin the procession and confer degrees to 1,786 students, awarding 1,236 bachelors, 506 masters and 44 doctorate degrees. We extend our congratulations to all, to our MARC Director, Cathie Atkins, our Program Coordinator Thelma Chavez, to MARC mentors, to the students and their supportive families who have encouraged, nurtured and helped to make their dreams come true. We proudly congratulate the MARC students on their academic achievements and successful graduation from SDSU and wish them a bright and promising future as they continue on to their graduate studies. 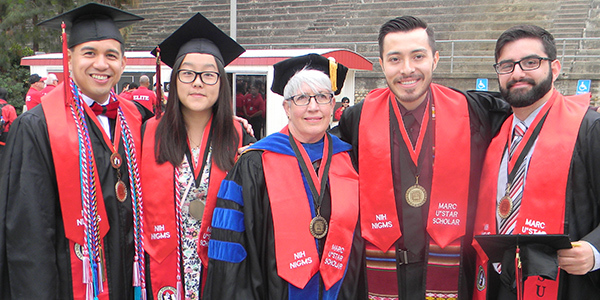 The MARC program would like to recognize our five graduates for their hard work and accomplishments while at SDSU.